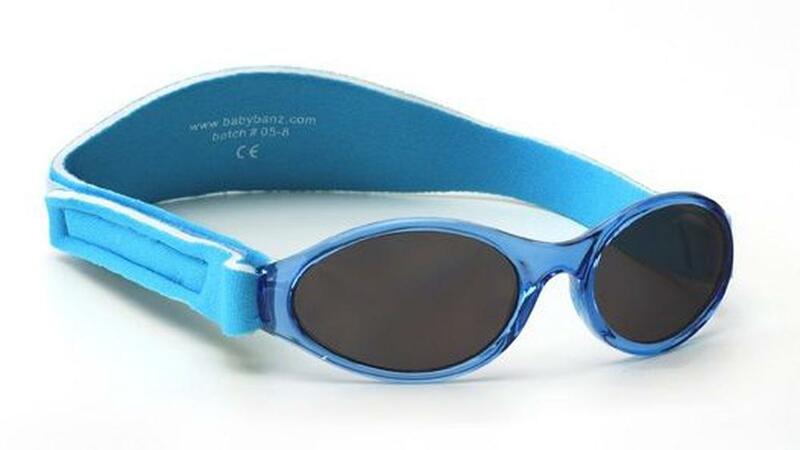 Adventure Banz sunglasses are the premium range from Banz, the children's sun-safety experts! Adventure Banz sunglasses feature a soft silicone nose and brow piece (same colour as sunglasses) and are designed for maximum comfort. Category 3 lenses (which meet the Australian/New Zealand standard AS/NZS 1067) offer 100% UVA and UVB protection and high sun glare reduction. A patented neoprene wraparound headband with hook-and-loop adjustment keeps sunglasses in place, and is adjustable for growth. Made of sturdy, shatter-resistant polycarbonate, of ophthalmic quality, Adventure Banz sunglasses boast great looks and top-quality safety protection! Baby size fits from 2 months to 2 years approx, or between 43cm and 52cm head circumference, measured over baby's eyes (NOT the temples, where Plunket measure).